When it comes to outdoors expertise, no one understands Colorado’s fishery and wildlife resources better than Colorado Parks and Wildlife’s diverse staff of wildlife managers, park rangers and biologists. For these dedicated individuals, working for CPW is not just an occupation but a way of life. When they’re not enforcing fish and game laws, patrolling state lands or conducting fish and wildlife research, most CPW employees are avid sportsmen and women who spend their leisure time hunting and angling throughout the state. Here, CPW staff share their personal stories and experiences, provide on-the-ground field updates and offer a unique, “inside” perspective on all things hunting and fishing in Colorado. 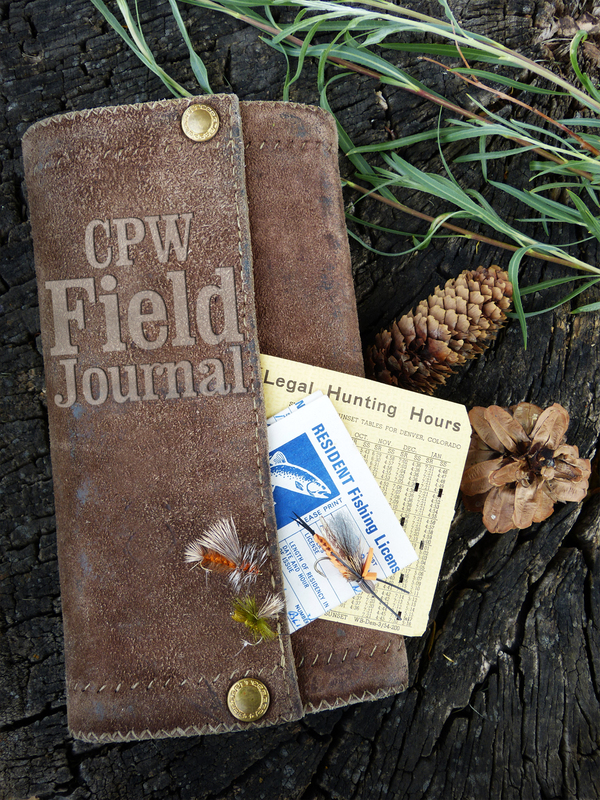 In this special, multi-part series of CPW Field Journal, CPW employee Michael Scott shares his personal experiences applying/drawing for sheep and moose licenses, and provides real-time updates during his preseason scouting and fall hunting trips. I completed one adventure (the sheep hunt), and now I needed a break. Not because I was physically tired, but because I knew that packing out a moose was going to be a much tougher job than packing out a sheep. As I mentioned in my very first post, I applied for 21 years for both species and, as luck would have it, I drew both tags this year. The sheep hunt was done. Now I had just two weeks before the archery moose season began. To prepare for my hunt, I attended the first-ever “Colorado Moose Hunting Orientation” class during the sheep season which, ironically, Shannon had organized. The seminar was very thorough, and I learned a lot from the speakers. Although I have worked in the field most of my career with CPW, I found out that I still had a lot to learn about moose behavior and moose hunting. Additionally, I had not scouted much to this point because, quite honestly, I had been concentrating on the sheep hunt. But several folks had told me that once moose start their breeding season (rut), the bulls start moving in search of cows and a lot of your scouting goes out the window anyway. Regardless, I needed to look for good moose habitat and figure out how to access it as well as find out where the cow moose were spending their time. I again started by building a map of kill-sites from previous hunters’ harvest locations. Unfortunately, this was a fairly new unit and there had been very few licenses given out until recently. So, the information was sparse. However, the map gave me a good starting location, and satellite images from CPW’s Colorado Hunting Atlas provided a nice picture of willow-covered drainages in the county that would likely hold moose as well. I also searched Google Earth, YouTube and any other sites that featured amateur photos, videos or other postings of moose encounters and their locations. I even found a post where an unhappy anti-hunter had pointed out on a map exactly where one large bull and several others had spent last summer before a hunter shot one of them. This provided me with another place to look, which, I’m sure, was not the author’s intent, but “thank you” anyway! Like my sheep hunt, I was not searching for a record-book animal. I wanted a good hunt and hoped that I could find a mature, typical-looking Shiras moose. By that, I mean, I was hoping for a bull that was relatively wide (40-inches or more), had good, wide palms, decent brow tines and a decent number of points on each side (potentially, this could describe a new state-record or simply a very “average” bull). While I obviously preferred a larger bull, I wasn’t really intent on any set “score.” Rather, I assumed once I saw the bull, I’d know it was “the one” I was searching for. With my crash-scouting season now over, I started hunting. I immediately found areas where moose had spent the summer and also saw signs of recent activity. Tracks and droppings that were twice the size of those left behind by elk were clear indications that moose had been in the area since the last rain. I also found rut-pits — excavations of soil that have been urinated on by bulls — seemingly everywhere I hunted. Moose, and especially bulls, had recently used this area. 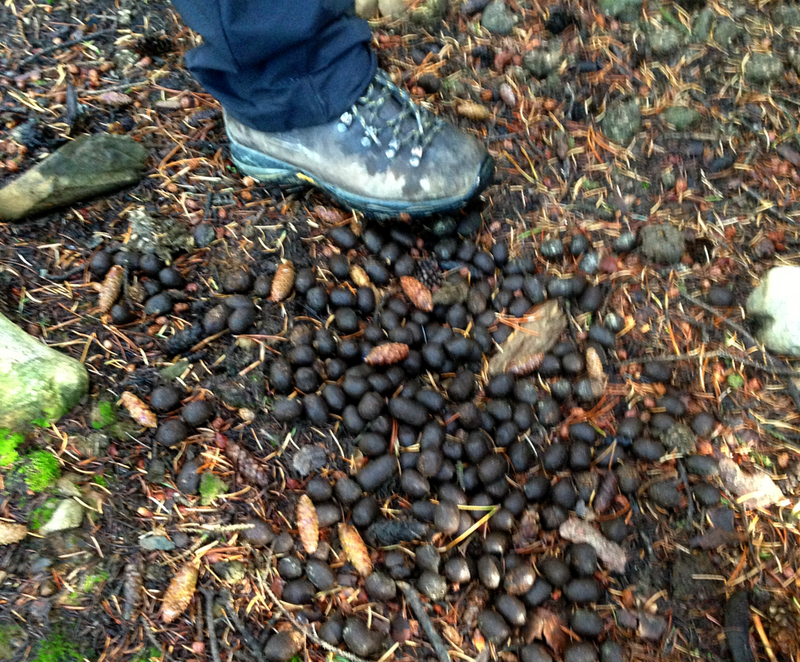 Moose droppings cover the ground — a sure sign of recent activity. Moose droppings range in color from green to brown to black. 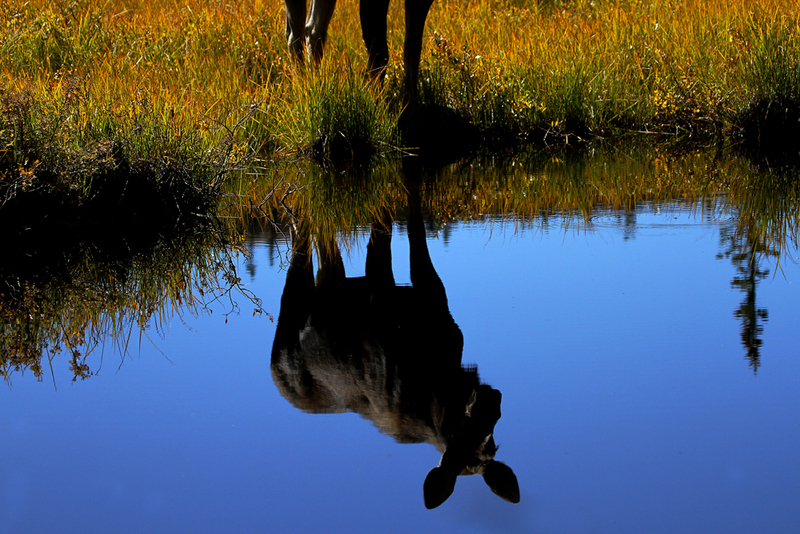 However, because moose are ruminants –meaning they regurgitate and chew their food — their droppings are typically uniform in both color and consistency. 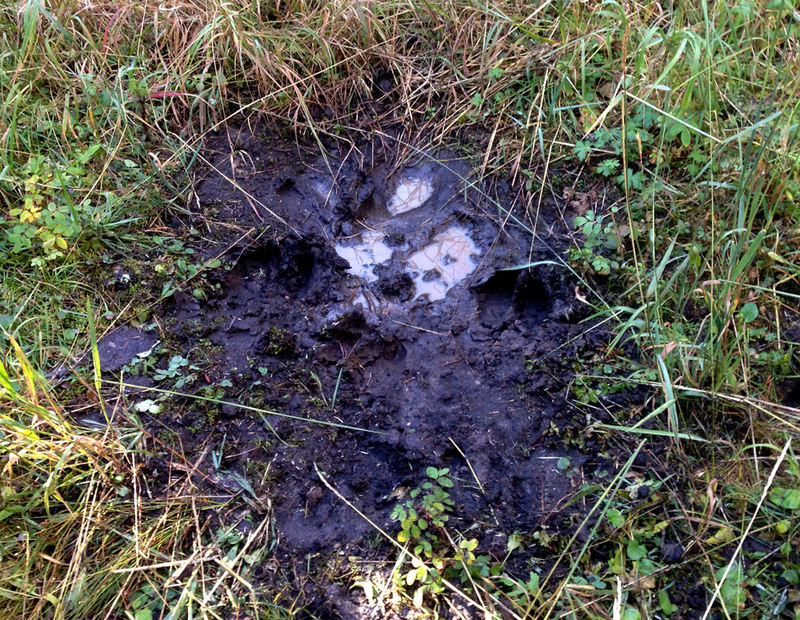 Hunters should look for wallow pits made by bull moose during the rut. Similar to bull elk, bull moose urinate and roll in these areas, covering their coat in a thick, musty scent to attract cows. 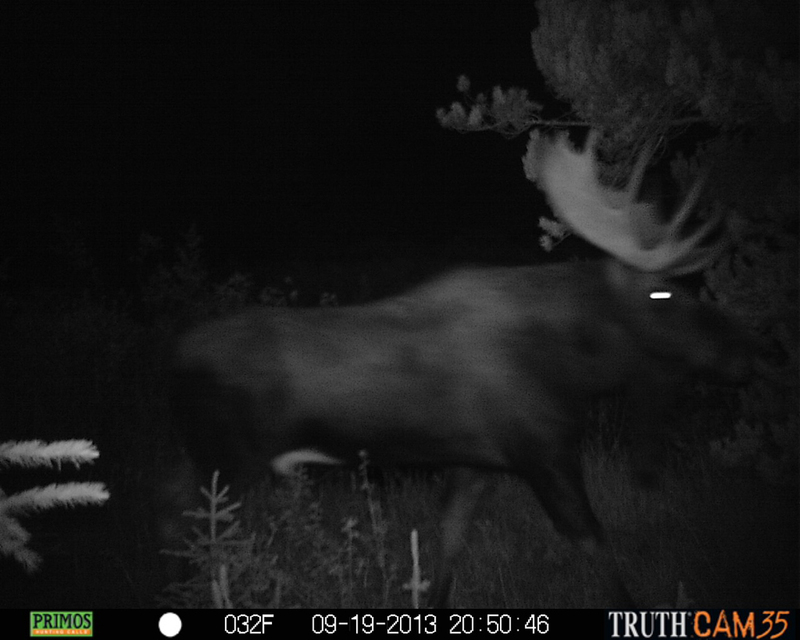 As far as first-hand reports, I really only knew of one large bull that an elk hunter spotted the week before. So I began there. Like many hunts, sometimes you have to cover a lot of ground before you find animals. I drove a number of roads in this “wilderness” moose unit searching for that big bull. Of course I did not find him, but a morning spent driving and hiking the edges of the willow drainages provided ample sign that several moose had been in the area. No matter where you are scouting, look for rubbed trees. Bull moose begin rubbing in early September to clean velvet off their antlers. The willows and serviceberry branches had been largely stripped of leaves next to the timber. Tracks and droppings were everywhere. Obviously, this was great moose habitat, but where were the bulls? I spent a couple of days hunting the adjoining drainages, morning and night, as well as calling from time to time. But it seemed as though my timing was wrong, my calling was bad or the moose were not yet in the rut. I set up a game camera, after several days of unproductive hunting, in an effort to see if I was wasting my time. I wanted to know if the big bull was even still in the area, before I switched my focus to other, more “traditional” locations. Trail-cams are an excellent tool for big-game hunters. I saw cow moose and calves in a number of spots, but no bulls to this point. Shannon joined me for a hunt on the edge of the wilderness near where a friend of hers had seen a decent bull recently. After a short but vertical hike, we approached an area of ponds and willows. As we slipped into a location that we could glass, we heard the unmistakable sound of a bull moose. It seemed as though every sloshing step the bull took was accompanied by a grunt or groan as he walked directly at us. I quickly knelt next to a sapling and watched as the bull stopped about 20 yards from my location in the trees. I looked back at Shannon who was indicating that she thought it was a pretty good bull. I looked closer through the binoculars and saw that although he had wide antlers and one side was tall, palmated and had decent points, the other side was more elk-like. Shannon saw this as well, and another look confirmed that we both thought I should pass on this bull. I guess the moose was thinking that he would pass up whatever he smelled too, because he turned and headed back into the willows and water. We then moved up the drainage several hundred yards and set up on the hill, which overlooked a large meadow and willow park. 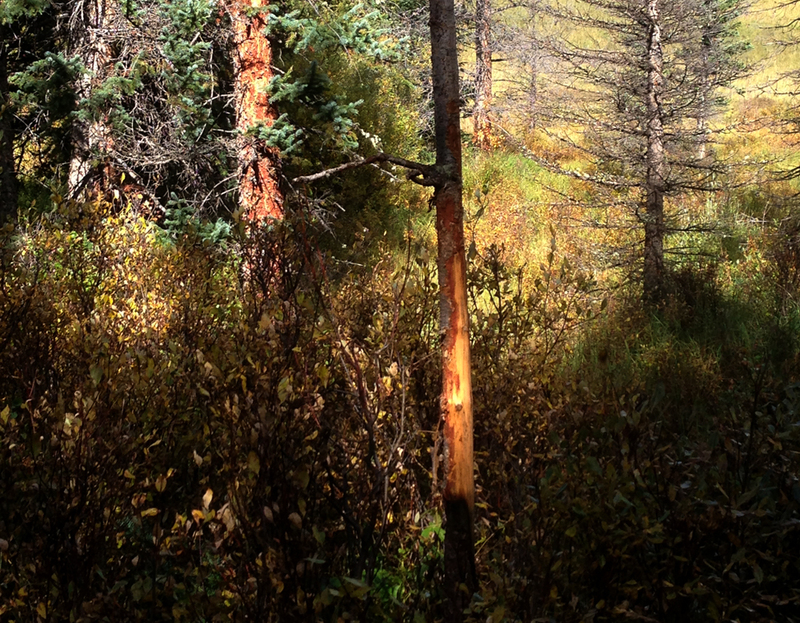 Eager to try out my unproven moose-calling skills, I tried a cow call. Immediately, we heard the grunt of a bull moose approaching fast from behind us on the hill. Certainly, it couldn’t be the same bull, could it? Shannon scrambled into the trees to my right. I backed into the nearby spruce branches and nocked an arrow. Then, as I listened to the fast-approaching grunts, I was soon greeted by the sight of a large bull, boasting both tall antlers and long points. This was definitely a different moose. Having zeroed in on the cow call I let out, the bull stopped 4 yards above and looked down toward the meadow behind me. He was panting and licking his lips, obviously in full rut and eager to find the cow who had been calling to him. I was at full draw with my bow and looked hard to determine if this was the bull I wanted to shoot. I kept thinking, “It couldn’t be this easy, could it?” As the bull stepped forward and turned his head, I could see that although he had tall antlers, he was not as wide as I had hoped and his left side was shorter and less palmated than the right side. No doubt, this was a beautiful bull, but not “the one” I was looking for. Nevertheless, this bull had only one thing on his mind, and I did not want to be mistaken for a cow at this point. Still at full draw, I stood up and stepped back into the trees even farther. At this point, I thought I might have to shoot the bull in self-defense! Almost dismissively, he stepped forward and headed down the hill toward the meadow, nearly walking over Shannon who had been hiding in the trees. Shannon scrambled behind me to get out of the way. Eyes wide, we both watched as the bull trotted into the meadow, nose to the air, still searching for the “cow” that had called to him. It took a few seconds for both of us to absorb what had just happened, and we then hurried to dig cameras out of our packs. With both of us still in awe at what we had just experienced, Shannon asked me if I was certain that I had made the right decision. I began to second guess my evaluation. She was probably right. How often would I be able to call a very nice bull to within 4 yards when bowhunting? But I was still certain that I’d know when I had found the right bull, and this just wasn’t “the one.” Anyway, it was too late. All I had now was video and pictures of the bull, a memory ingrained in my head as well as the advice of a number of hunters who told me that if you pass on a bull, you will probably never see him again. Of course, as we hunted the next couple of days, we did not see that bull or any others. In fact, everyone that I showed the pictures to told me that I was crazy not to shoot him, and I was now starting to believe it. There was still a week and a half left in the season. Maybe I would see him again . . .